LONDON, England (CNN) -- Britain's Queen Elizabeth II unveiled a new medal Wednesday to honor the families of British service personnel killed while serving their country. 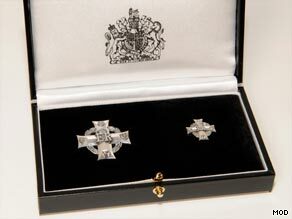 The Elizabeth Cross may be given to family members of service personnel who have died since 1948. The Elizabeth Cross will be given to the next of kin of armed forces personnel killed on operations or as a result of terrorism "as a mark of national recognition for their loss," the Defense Ministry said. It is the first time the name of a reigning monarch has been given to a new award since the queen's father, King George VI, instituted the George Cross in 1940. That medal recognizes acts of bravery of both civilians and military personnel. The most prestigious medal, the Victoria Cross, was introduced by Queen Victoria in 1856 for acts of gallantry by the armed forces. "This seems to me a right and proper way of showing our enduring debt to those who are killed while actively protecting what is most dear to us all," the queen said in a message to the armed forces. "The solemn dignity which we attach to the names of those who have fallen is deeply ingrained in our national character. As a people, we accord this ultimate sacrifice the highest honor and respect." The Elizabeth Cross is a sterling silver emblem in the shape of a cross over a wreath. In the center is the queen's monogram, EIIR, which stands for Elizabeth II Regina, or Queen Elizabeth II. At each of the four tips of the cross are floral symbols: a rose for England, a thistle for Scotland, a shamrock for Northern Ireland, and a daffodil for Wales. The reverse of the cross will be engraved with the name of the person who died. The name will also be written on a scroll signed by the queen, to be given to family members along with the medal, the Defense Ministry said. The award may be given to family members of all service personnel who have died since 1948. Charles Mosely, the former editor in chief of Debrett's, an authority on etiquette, said the Elizabeth Cross is a good way to recognize the sacrifice made by members of the military and their families. "It seems very praiseworthy and very overdue," he said. It makes sense for the medal to be named after the reigning monarch, he said, because she is head of the armed forces. "They have personal allegiance to the sovereign, a personal loyalty," he said.